This is part II of a guest post by Jean Laherrère, long term contributor to The Oil Drum. Jean worked 37 years for TOTAL on exploration and production of oil and gas, and since his retirement, has worked tirelessly to analyse the world’s oil & gas data and developments. In part I of this article, Jean looked into Maugeri’s concepts of production capacity and reserve growth. It showed how Maugeri’s bottom-up analysis is based on optimistic assumptions regarding Iraq and by taking at face value the data published by OPEC. Furthermore, Jean pointed out that man of Maugeri’s oil production forecasts are above any projections by any agency, most notably in the case of the US. In this second part, Jean dissects Maugeri’s assumption on reserves growth, on which his optimistic production forecasts relay. It his shown how Maugeri wrongly extrapolates the effects of flawed reserve accounting in the US to the rest of the world. Maugeri’s also fails to acknowledge the conflicting reports and reporting practices of the several agencies producing oil data at world level. There are also some important remarks on the Maugeri’s concept of conventional oil and other details that bring into doubt the knowledge of this author on the field. Reserve growth is a crucial element in the evolution of oil supply, and is often ignored or underestimated. 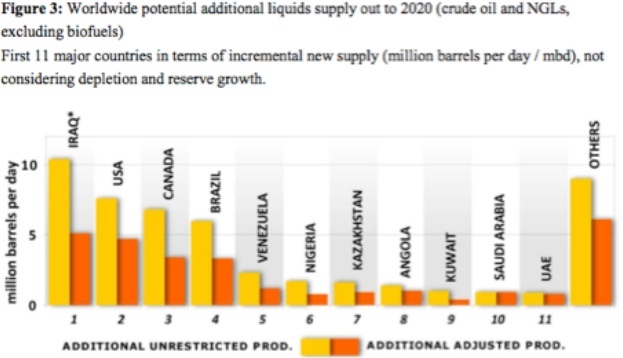 Most analyses on oil reserves and supplies focus primarily on depletion rates of already producing oil basins, subtracting from reserves, and assuming a reduction of future production, without adequately factoring in their reserve growth. This underestimates the production of several oilfields, particularly the larger ones. Because of “reserve growth,” a country or a company may increase its oil reserves without tapping new areas if it can recover more oil from its known fields. One of the best examples of the ability to squeeze more oil from the ground comes from the Kern River Field in California. The 2004 USGS paper entitled “Justification for proposing a study of large petroleum fields”, authored by T.R. Klett, displays reserve growth for giant oil fields between 1981, 1996 and 2003. This growth was negligible outside OPEC by 2003. It is over 100 Gb from 1981 to 1996, but it is well known that during the period 1985-1989, the increase of 300 Gb for OPEC proved reserves represents in fact speculative resources. In the wake of the oil counter shock, OPEC members fought for market quotas expanding their declared deserves, as described in 2007 by the former Saudi Aramco Vice Presidente Sadad al-Husseini. Scout reserves databases are today obliged to report field estimates provided by NOCs since the NOCs are their customers, which was not the case in the past. Reserve growth is confused by the reporting of remaining proved oil reserves. The only world official oil reserves are those reported by USDOE/EIA, IEA, OPEC and BP. 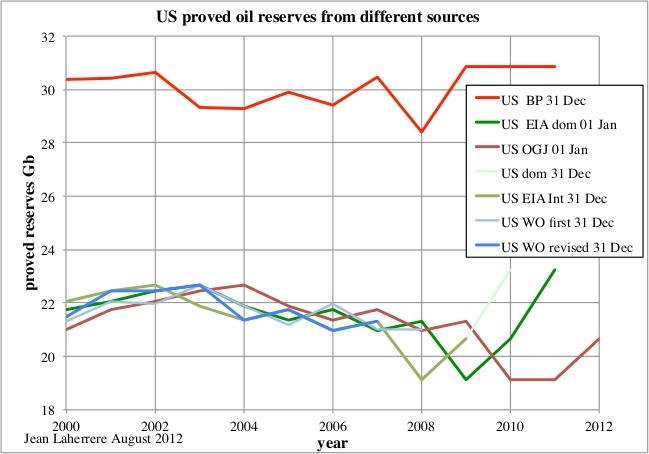 Only EIA and BP provide a friendly updated database for proved reserves for every producing country since 1980. The remaining reserves are reported by the OGJ in January of every year, compiled from an inquiry difused in December, leaving no time for any technical study to be carried out. It is mainly a political statement and when the national agency does not answer (majority of cases), the last value from the previous year is kept. In its latest issue of this, from the 1st of January of 2012, the OGJ reports data updates for only 32 countries, with 109 countries left unchanged, showing clearly that this data has nothing to do with reality! The source of confusion is that all IOCs are listed in the US stock market and they must follow the SEC (Security and Exchange Commission) rules, which up to 2010 forbade the reporting of probable reserves. Only proved reserves, with the ambiguous definition of reasonable certainty to exist, could be reported; but these figures must be audited. OPEC countries report also proved reserves but without any audit, and the data is completely political. 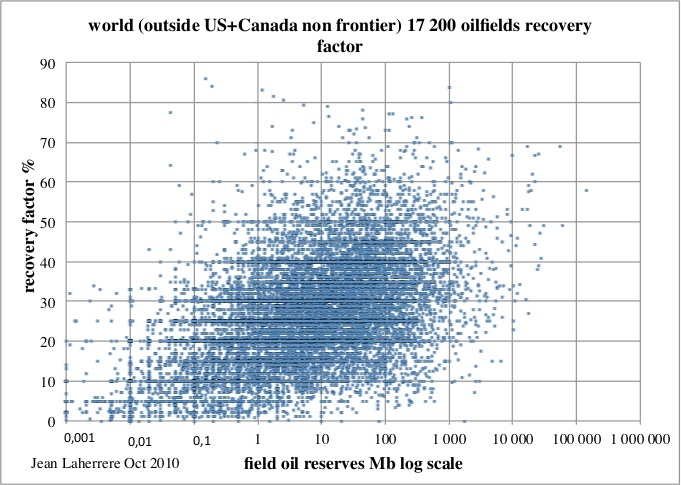 The most amazing is that it is recognized by the SPE (see my analysis here) that adding field by field proved reserves of a country underestimates the proved reserves of the whole country. It is wrong to add proved reserves but, being this a rule of the SEC, it is done by every one. Only mean field reserves can be added arithmetically to obtain the mean reserves of the country (or of the world). SEC rules were written to protect bankers and shareholders, not to satisfy science! IOCs keep their oil field reserves data confidential and there are only a few countries that oblige operators to report field estimates: the UK, Norway, the US federal Gulf of Mexico and some other US States such as California. Scout companies sell field reserves data that are 2P estimates because it is the data which is used to decide the development of their fields, based on the net present value computed on the mean reserves. The IOC’s 2P reserves satisfy science! 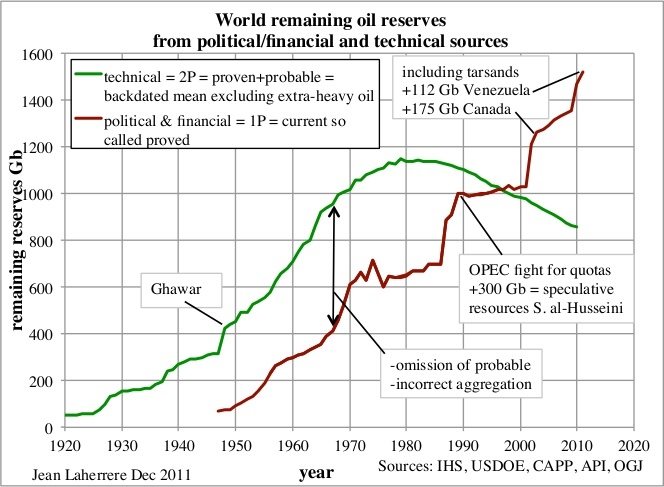 There is a huge difference between the political (OPEC)/financial (SEC) proved oil reserves (as reported by EIA) and the technical 2P figures, as shown by the following graph. The most amazing is to find that the USDOE/EIA table of world crude oil proved reserves since 1980, published in July of 2012, provides no definition of the year of report, but the data for every country, except the US, corresponds to the OGJ data published in the 1st of January. For the US the last value is 20.682 Gb for 2009, with NA (not available) for 2010, 2011 and 2012. The comparison with the EIA domestic data indicates that 20.682 Gb corresponds to 2009, but it is on the 31st of December (as indicated on the web version, while in the spreadsheet version it’s unclear). The domestic site also reports the value for 2010 being 23.267 Gb. It seems that the international EIA site ignores the EIA domestic site, and no one bothers to check why the definition for the US is different from OGJ data. The EIA reports exactly the OGJ data for the world outside the US, except that the OGJ reports the Neutral Zone (50/50 Kuwait and Saudi Arabia), when the EIA reports Kuwait and Saudi Arabia including their share of the Neutral Zone. In conclusion, EIA reports reserves at the end of the year for the US and for the rest of the world at the beginning of the year: it is a poor practice! The difference is small because the small variation of the US reserves in front of the uncertainty of the estimate, but the practice is flawed. 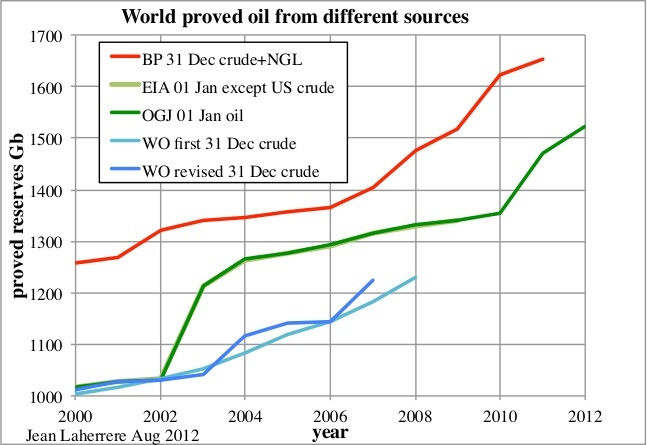 The value for US proved oil reserves from different sources shows the chaotic EIA reports for crude oil (domestic site at the 1st of January, while the international at the 31st of December) and OGJ (which wrongly repeats the same value for 2000 and 2001) and the large difference with BP, which reports crude oil and NGL at end year. WO reported also reserves at end year and revised reserves for the previous year, but WO stopped reporting world oil reserves in 2009. 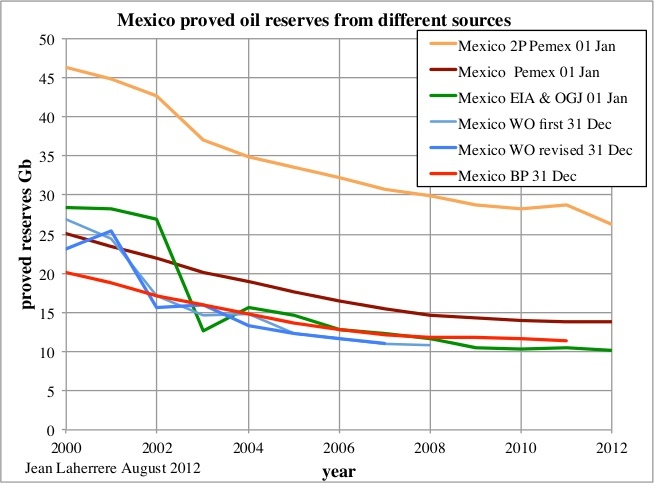 The comparison for Mexico oil reserves shows the difference between EIA/OGJ, WO, BP and Pemex, which also reportes the 2P. Pemex 1P is smooth compared to the erratic EIA/OGJ. It is strange for the EIA to trust more the obviously political and unreliable (reported too early to be technical and never revised) OGJ values than the official Pemex values. For world proved oil reserves, the difference between the EIA and OGJ is very small, but it is huge compared with BP and WO because of the partial inclusion of the extra-heavy oil. The latter should be reported separately because both the trapping and production are different. All OPEC reserves are unaudited. Only Kuwait values were audited at the request of the Parliament after a paper in 2006 by Petroleum Intelligence Weekly (PIW) reported that Kuwait’s proven reserves were about half of what the government claimed. The result was kept confidential, but Kuwait did not change their reserves, likely changing the definition: the rumour was that the audit diminished the proven reserves, but the 2P (proven + probable) was close to the Kuwait value. In 1985, OPEC decided to tie proven reserves (the 90 percent category) to production quotas. Under its agreement with other OPEC producers, Kuwait has the right to produce nearly 2 million barrels per day. Its quota is based on Kuwait’s official statement that it has 99 billion barrels of proven (remember the 90 percent) oil reserves. In other words, Kuwait is allowed to produce 2.247 million barrels per day because it has nearly 100 billion barrels in proven reserves. 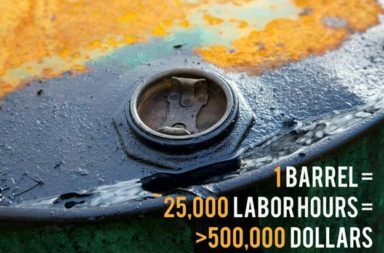 In reality, Kuwait produces around 2.6 million bbl/d, according to the US Department of Energy and official OPEC statistics. The EIA simply recopies the OGJ data; the only change is that the EIA includes the Neutral Zone (50/50) within Kuwait and Saudi Arabia, when the OGJ reports the Neutral (or Divided) Zone separately. 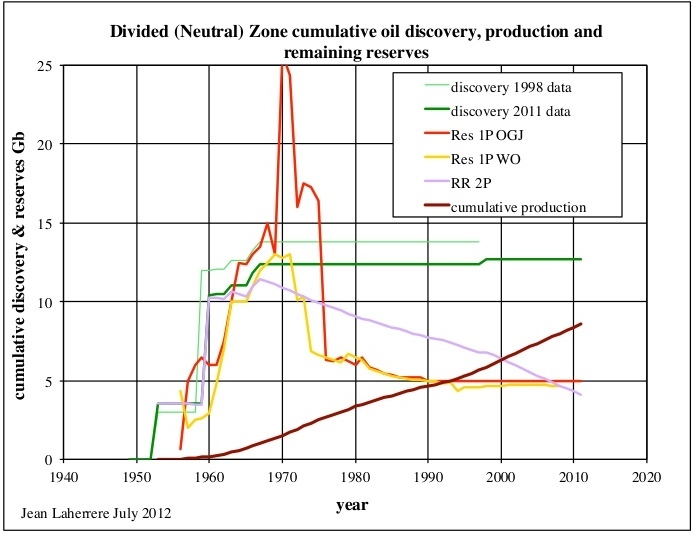 The Neutral Zone proved reserves have been at 5 Gb since 1990, despite significant production in the meantime, and no discovery since 1998! 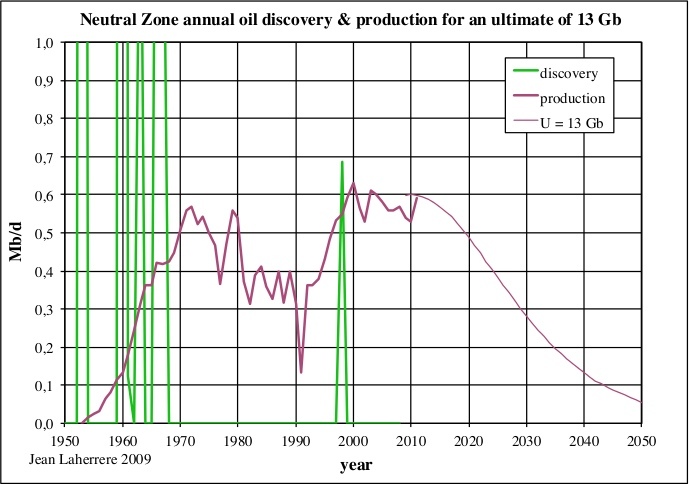 The Neutral Zone cumulative 2P oil discovery is 12.7 Gb in 2011 data, but 13.8 Gb in 1998 data, showing a surprising negative reserve growth. We assume that the oil ultimate is 13 Gb. The Neutral Zone is the only place in OPEC which did not display a large reserve growth during the 1985-1990 period, because its reserves are not involved in the political fight on quotas. Also because the owners of the Neutral Zone (Kuwait and Saudi Arabia) increased their reserves at different moments in time. The Neutral Zone production is modelled using an ultimate of 13 Gb, this figure being the asymptote of the cumulative discovery. For Kuwait, the creaming curve with data from 1998, 2009 and 2011 shows an obvious flattening since 1965, and there is no hope for deepwater discovery! Political growth seems to exist in 2009 and 2011 data and we believe that 2011 data should be corrected by 10 %, leading to an oil ultimate of 90 Gb. 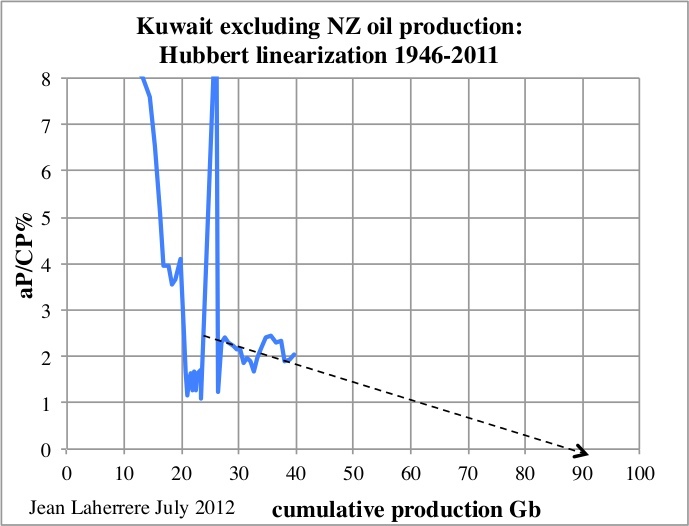 The Hubbert linearization of Kuwait oil production is hopeless for any extrapolation; the data is chaotic because of OPEC quotas and the several wars in the region. The main Kuwaiti field (and the first found in 1938) is the Greater Burgan. Its annual production data is hard to find and chaotic for the same reasons above (in particular with 350 wells set on fire in 1991). Its ultimate is reported to be 60 Gb, but it is impossible to confirm with reasonable accuracy regarding its present oil decline. 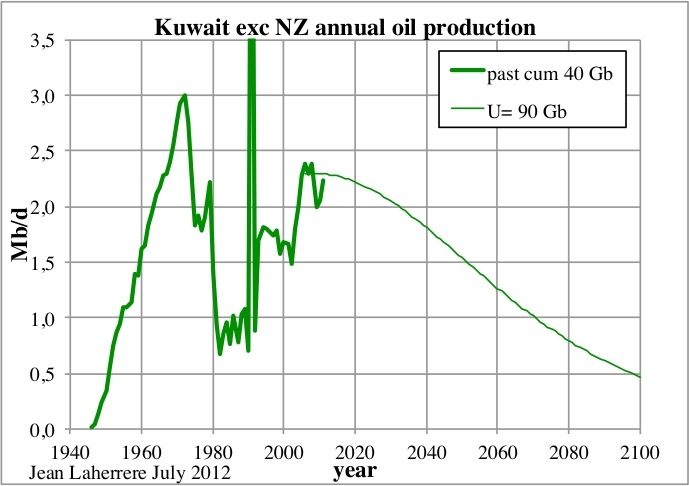 Assuming an oil ultimate of 90 Gb with a cumulative production of 40 Gb at the end of 2011, the forecast of annual oil production shows that in 2100 Kuwait will still be producing 0.5 Mb/d. 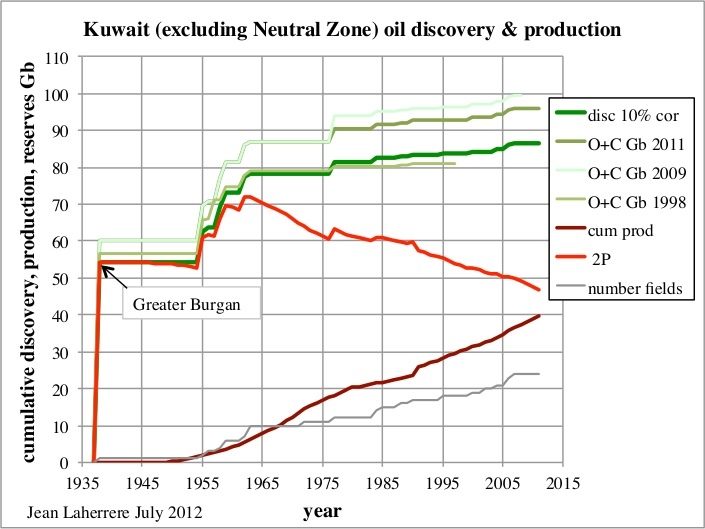 Following is the cumulative oil discovery and production for Kuwait without the Neutral Zone with the data from 1998, 2009 and 2011 editions (in green) for a total of 24 fields. 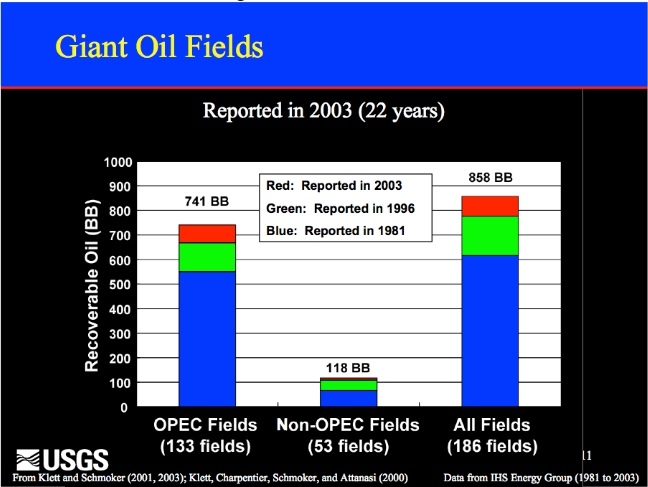 There is a significant increase from 1998 to 2009 data due to the fact that more and more scout field databases are obliged to report OPEC values in order to not upset national agencies. It is the same for BP which reports only national agencies reserves and not their own. But in 2011 there is a surprising negative reserve growth, as it is shown for the Neutral Zone. 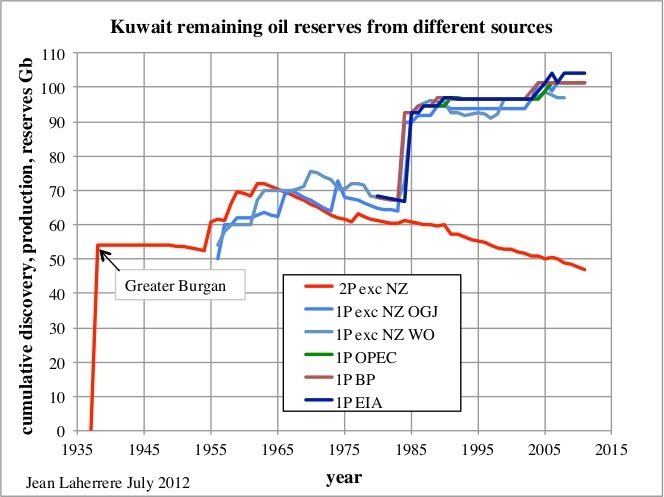 The comparison of remaining 1P reserves (OGJ & WO) and the technical (correction of last data by 10%) 2P shows clearly that the reserves increase by Kuwait in 1984 of 50% is merely political. Kuwait’s oil reserves from different sources vary, including or not the Neutral Zone, suffering also from the discrepancy between the 1st of January and the 31st of December. Confusion is the rule in order, to avoid comparison. The fires set by Saddam Hussein in 1991 burnt somewhere between 4 Mb/d and 6 Mb/d, mainly in Burgan, summing to estimated total of 2 Gb , but this is hardly noticeable in the 2P values. 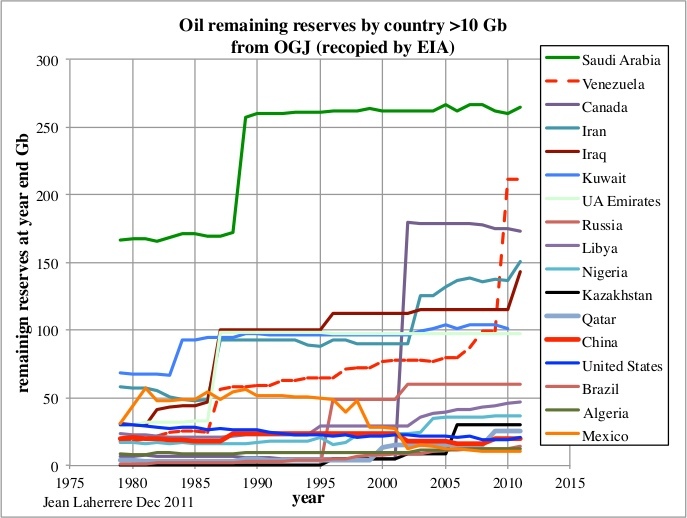 The reserves display by country (with over 10 Gb of proved oil reserves) from the OGJ shows clearly the drastic step increases, when in reality reserves vary slowly, except when supergiant fields are discovered. This data is strictly political and should be ignored! But it is the only data shown by the OPEC countries, still constrained by their fight on quotas? Might we have to wait for OPEC quotas to disappear, so that the truth can be known? The reserve growth in OPEC claimed by Maugeri is very questionable because of political fights between OPEC members over quotas. The political increase of 300 Gb in OPEC reserves between 1984 to 1989 has been described by ASPO as political, but is attributed to technological progress by most analysts. In 2007 the retired Vice-President of Suadi Aramco, Sadad al-Husseini, stated in London at the Oil and Money conference that these 300 Gb were speculative resources, confirming the ASP0 claims! Scout databases (in particular IHS) are obliged to report OPEC field data when reported by OPEC members. Maugeri’s claims of reserve growth in the US, by taking as example Kern River, is also comparing apples and oranges. 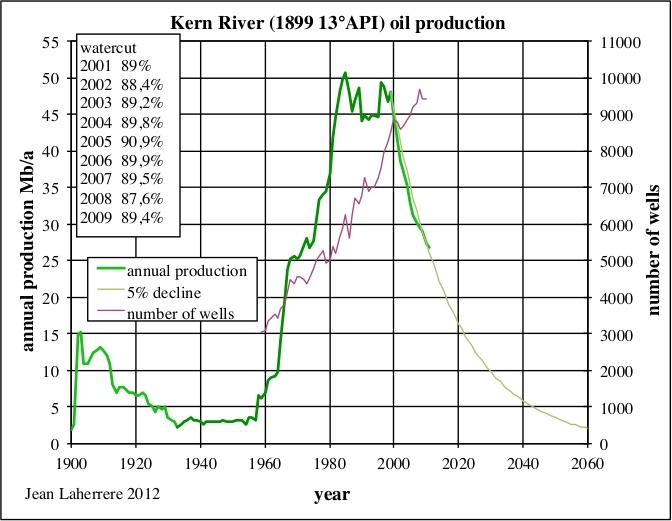 The reserve growth at Kern River is due to SEC rules, which is a very poor practice to represent the truth. Maugeri used already Kern River in his 2009 Scientific American paper and I criticized it. Kern River was discovered in 1899, containing heavy oil (13% API), as is Midway-Sunset, discovered in the same basin in 1894. Its production needs steam injection (tertiary recovery, which makes it an unconventional field) and started to increase in significant quantities in 1960, with an increase of producing wells, from 3000 to 9500 in 2010. The peak of production was between 1982 and 2000 (one century after discovery) and since 2000 production declines by 5 %/a, despite a still rising number of wells. Its present watercut is around 90%. The California Department of Conservation provides all the data since the start. Here there is no problem with data. Following SEC rules, only proved reserves around producing wells are allowed to be reported (a change since 2010), while the known undeveloped part of the field cannot be reported as reserves. So reserves grow with the number of wells and this reserve growth is merely due to poor rules and accounting practices. A rule of thumb often used in the US (even by the USGS) is to report as reserves ten times the present annual production. 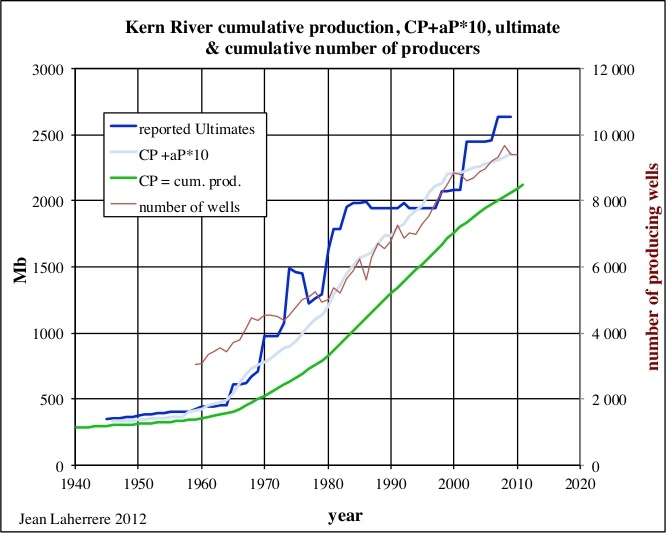 The reported ultimates for Kern River from 1945 to 2009 can be compared with the number of producers, the cumulative production and the ultimate computed by adding the cumulative production with ten times the annual production. This plot (light blue) follows the trend of the reported ultimates (dark blue), but whenever it is larger than the reported ultimate, this value is increased. In the 1960s, introduction of thermal recovery technologies (application of steam technology) caused abrupt and substantial additions to reserves in fields that contain heavy oil (American Petroleum Institute (API) gravity less than 20 degrees). Similar additions to reserves have continued to the present. During the 1980s, reserve additions began to be made using hydraulic fracturing in Monterey Formation diatomites (sedimentary rock made up of the tiny silica skeletons of diatoms) on the west side of the basin. These additions have increased as production from diatomite replaces declining, but still substantial, production from overlying steam-flooded reservoirs. Since 1965, more than 8 billion barrels of recoverable oil have been added to reserves within existing fields. 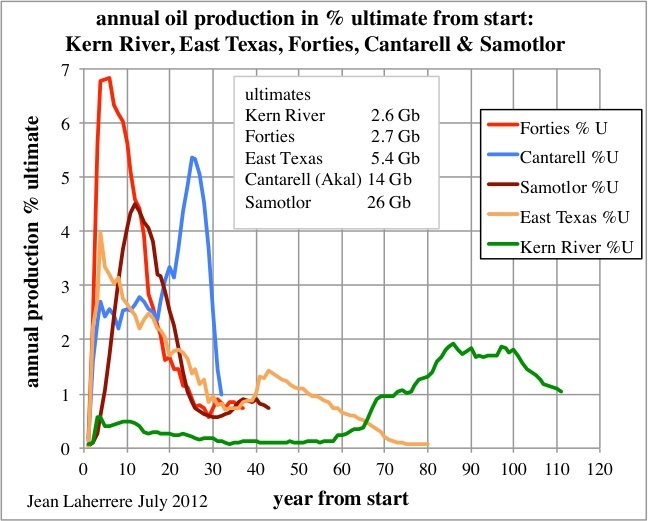 Kern River displays a different pattern when annual production is plotted as percentage of its ultimate from production start, when compared to East Texas, Forties or Samotlor or even Cantarell (Akal-Nohoch field using an unconventional nitrogen injection). The ultimates are estimated to be 2.6 Gb for Kern River, 2.7 Gb for Forties, 5.4 Gb for East Texas, 14 Gb for Akal/Cantarell and 26 Gb for Samotlor. Kern River is a very poor reference for claiming reserve growth, for it is an unconventional field with a completely different behaviour. Maugeri should have taken a conventional field as East Texas for reference, but he has preferred not to, because East Texas is the case of a large negative reserve growth, with the present estimate at 5.4 Gb (almost depleted) when from 1970 to 1990 the OGJ ultimate was 6 Gb, 10% higher than reality. It is the same negative growth for Brent oil reserves estimated by the Brown Book 2000 at 368 M.m3, when now the estimate (Brent is almost depleted) is 322 M.m3, or 13% less. 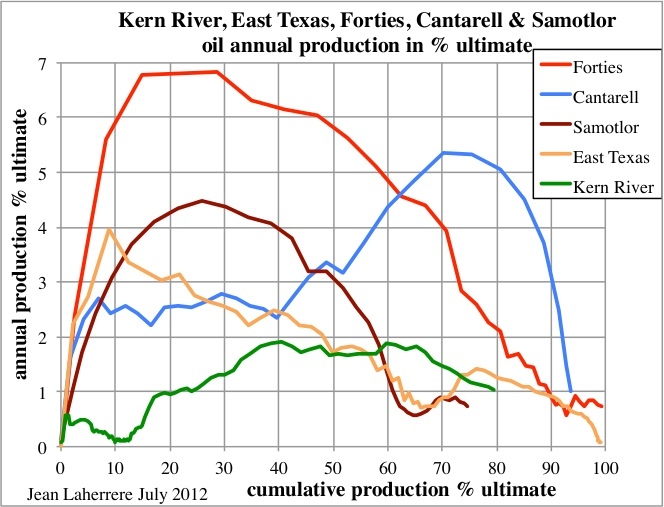 The plot of these five fields in annual production as percentage of the ultimate versus cumulative production as percentage of the ultimate shows clearly that Cantarell and Kern River are unconventional fields. They contrast with East Texas, Forties and Samotlor, that display similar behaviour among themselves. Forties, being offshore, is recovered faster, with a 7% rate at peak, when this value is less than 5% for Samotlor and 4% for East Texas (using only primary recovery because secondary recovery with water injection started after 70% of the cumulative production was produced). Cantarell used nitrogen injection only after 50% of cumulative production. 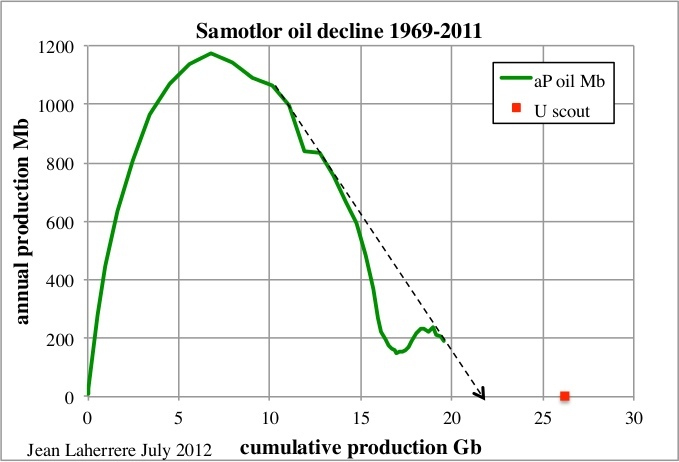 The reported ultimate of 26 Gb for Samotlor is difficult to be confirmed by the oil decline, because of the collapse at the breakdown of the Soviet Union. A smaller ultimate is possible! A 6% decline rate over 10 years would amount to 54% of the original amount, not “the almost complete loss….” Mistake or propaganda? From the available annual oil production by field, it appears to me that the databases are to questionable, contradictory and incomplete to get a reliable estimate of the world decline rate. The additional adjusted production from 2011 to 2020 for the US is given by Maugeri on his Figure 3 as 4.7 Mb/d. 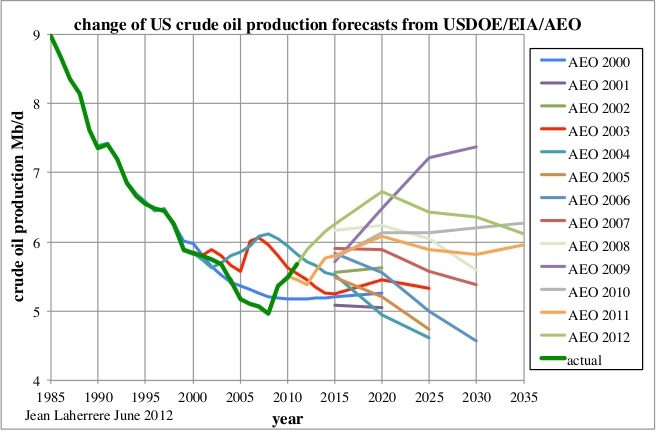 But USDOE/EIA AEO 2012 forecasts only for crude oil production an increase of about 1 Mb/d for the same period, 2020 being a secondary peak, as shown on this graph displaying AEO forecasts from AEO 2000 to AEO 2012. The display looks chaotic, showing clearly that the forecast is unreliable! This forecast annual peak at 6.7 Mb/d for 2020 should be compared to the previous peak in 1970 which was close to 10 Mb/d. The term shale oil is now old fashion and replaced by tight oil! The word shale is now associated to hydraulic fracturation (called fracking in the medias) and has gained a bad reputation. It is time to use a better term! 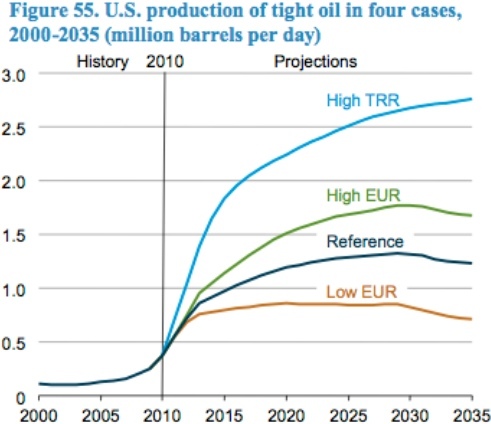 Maugeri forecasts an increase of tight oil production of 4.17 Mb/d (admire the accuracy!) from 2010 to 2020, when AEO 2012 (figure 55) forecasts an increase of 0.8 Mb/d in its reference case and a maximum of 1.9 Mb/d, less than half of Maugeri’s claim! Like I always say, when more than two significant digits are given, it means that the second is surely wrong and likely also the first one, because the author has a very poor understanding of the accuracy of the data! The IEA Oil market report for July 2012 states: “OPEC’s effective spare capacity in June was 2.35 mb/d”, far from Maugeri’s 4 Mb/d. But this 2.35 Mb/d is also wrong! 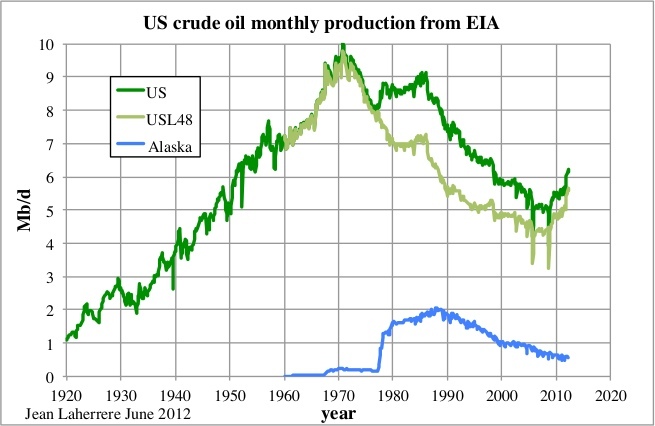 Bakken production in Montana (see figure 17 in part I) looks like a temporary bubble, as it was for the peak in 1968. The most important revolution in discovery was first the anticline model in surface geology, then the seismic common depth point and lately the deepwater. In the aggregate, conventional oil production is also growing throughout the world, although some areas (the North Sea, face an apparently irreversible decline of the production capacity. In most traditional producing countries, old oilfields go through a production revival thanks to better techniques and knowledge, or advanced exploration and production technologies, so far used only in the U.S. and in the North Sea. Huge parts of the world are still relatively unexplored for conventional oil (for example, the Arctic Sea or most of sub-Saharan Africa). The production of crude excluding extra-heavy oil, which is beyond conventional for most, is plateauing since 2005 as seen in figure 13: it is wrong to claim that the world conventional oil production is growing. It is difficult to say that the Arctic sea is conventional oil! Usually, once a company (or country) determines the producible reserves of a field (after having assessed its proven reserves, its initial rate of recoverability, and its costs) and begins to invest in its development, it is rarely wrong. Maugeri seems to ignore that the decision of developing a field is taken from the “net present value” of the estimated entire production based on mean reserves. Mean value (probability of about 45%) is far from proved value (probability assumed to be 90%). The proved reserves are only considered for not being too negative in the unlikely case that it occurs (there is a 10 % probability that the reserves could be lower), with a bad impact on the company assets. Maugeri’s presentation at CSIS also contains remarks worthy of further reflexion. This is a poor stand in front of claiming that technology has greatly improved. If only one third of the world‘s sedimentary basins are explored, it is because geochemistry (which can quickly estimate how much oil or gas the basin has generated with few samples of the source-rocks) has recognized that there is little potential to explore in two thirds of the world sedimentary basins. Every sedimentary basin has been drilled (even Antarctica with JOIDES/OPD wells) or sampled. Antarctica (exploration is forbidden for a while) has a poor oil potential as far as I know. Maugeri seems unaware that geochemistry, using Rock-Eval equipment and source-rocks samples, can evaluate the amount of oil and gas generated by the source-rock. On average, less than 35% of already known oil is extracted today using business-as-usual technologies. 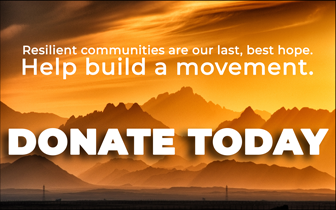 More expensive tech may dramatically increase oil recovery. The range of the oil recovery factor is from 0.1% to 86% (East Texas) and the cloud is so large that an average has no meaning and varies form the way it is computed. The median value is 41% when calculated from cumulative reserves or 25% if calculated from the cumulative number of fields. Business as usual is for economists but production engineers do not care for BAU because the recovery factor depends mainly upon the geology of the reservoir. 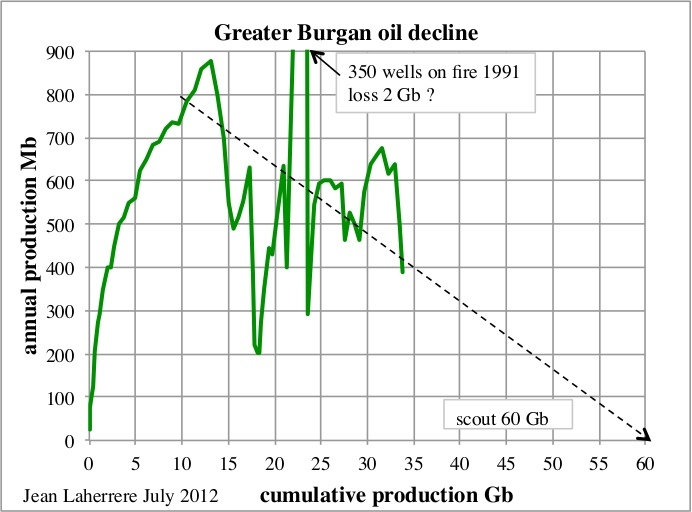 Technology cannot change the geology of the reservoir, but technology (horizontal drilling in particular) can help to produce faster, but no more (sometimes less) and with many examples like Yibal, the largest field in Oman, Rabi-Kounga, the largest field in Gabon, like Cantarell (figures 41 & 42) yielding a sharp decline.